Hi! I have been given the opportunity to costume a community theater production of AIDA. 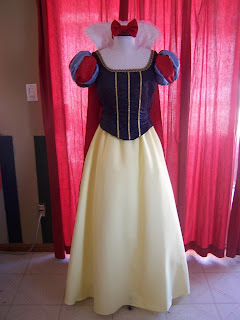 This project is going to be a full time gig and unfortunately I will be unable to do Princess dresses until it is complete. If I find that I have extra time I will be sure to post it here but there are 5 labor intensive high fashion pieces that will take at least a week each! As my projects get done for the show I'll be sure to post the progress here. Thank you for your support and I hope to see you all in August! 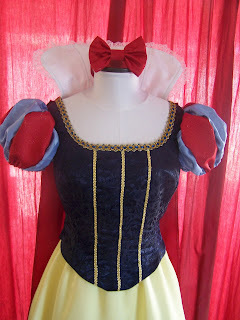 Here is the Snow White I sent yesterday. 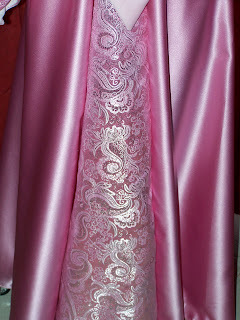 My dress this week has loads of beading on it and I'm really starting to be grateful that I don't do that very often. It's very tedious work! 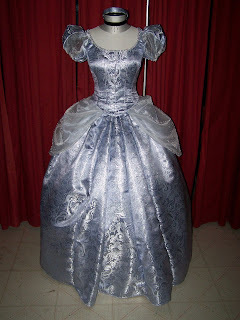 This dress really was done last week but the final payment was made today so here is fancy Cinderella. I tried a new idea on her skirt poofs and I think it will help hold the shape a little better. 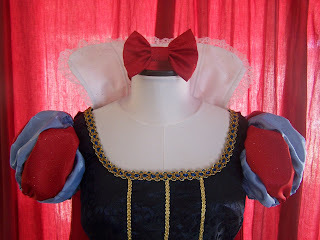 Snow White is done too and as soon as it is approved I'll put it on as well. 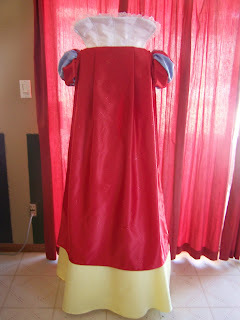 Here is the latest Sleeping Beauty request. 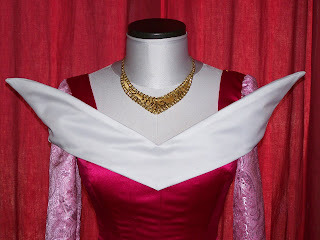 She asked for a panel in the front and the sleeves to match the panel. 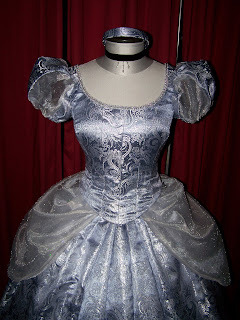 It looks closer to what Sleeping Beauty is wearing these days at the park. I love how it turned out, it adds just enough zing! 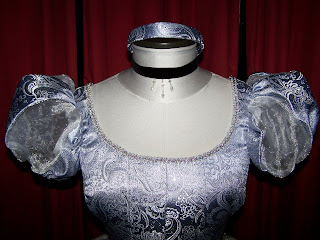 Next up is Cinderella in the same kind of fabric as the sleeve and panel, just in blue - of course! I always figured my first male costume would be a prince. 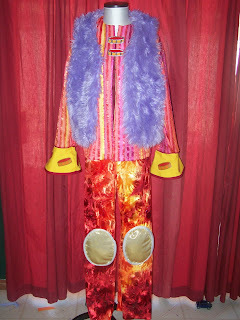 Instead it was a colorful rocker! He was fun and it was cool to figure out how to get all the details to work, like his drums. 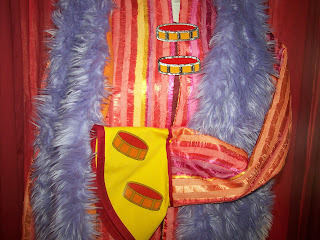 I was eating purple fuzz for a whole day after making the vest it got everywhere! Well after this fun custom request "break" I'm back to standard orders. 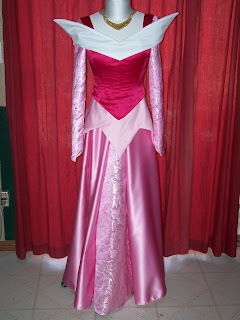 Sleeping Beauty is up next but she has asked for a few changes in the design. I'll let you know how it goes!